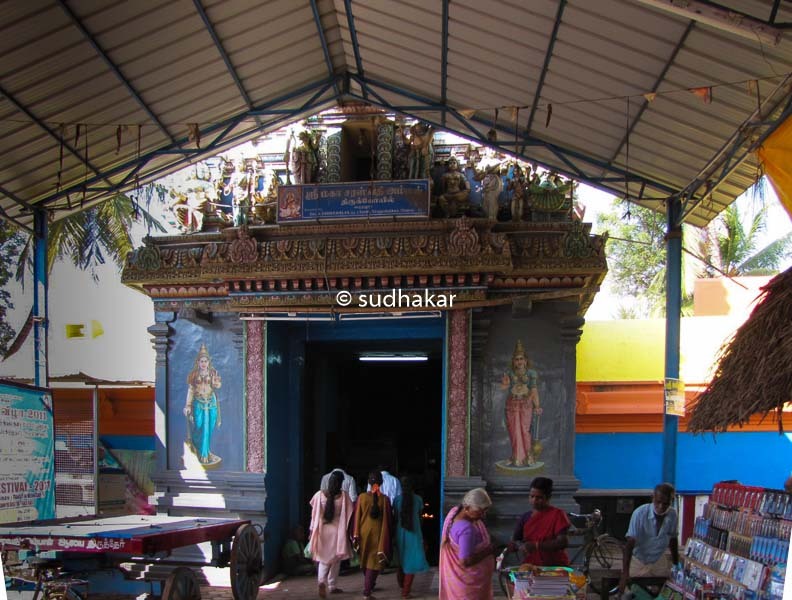 Saraswathy temple, the Hindu goddess of learning is situated in Koothanur which is at a distance of 25 kilometres from Tiruvarur and 40 kms from Kumbakonam. 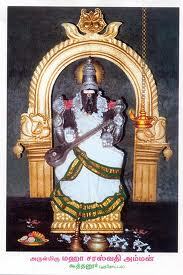 Koothanur is the only temple in Tamil Nadu for the goddess Saraswati. Historical facts says that Raja Raja Cholan II gifted a village to a Tamil poet called Ottakoothan. The origin of the word Koothanur originated from this. The temple is situated in the banks of Arasalaru (Harisol), a sangaman (merging of rivers) of the three sacred rivers, Ganga, Yamuna and Saraswathy. The temple is not a big one , has one main praharam. Goddess Saraswathy is the main deity here and is seen in a sitting posture with one leg folded. There are other small sannithis for Ganesha, Lord Muruga, Shiva and Brahma. As there is a beleif here among the students and children that praying here before exams brings them good results, students throng this place before board exams. Students used to write their exam roll numbers on the temple wall hoping to get good marks. As this practice of defacing the temple walls has been a growing menace, the temple now has reserved place on the wall with white laminated board where students can scibble their roll numbers. There are plenty of stationery shops on the both sides towards the entrance selling writing materials. Students buy them here, place them at the foot of the Goddess Saraswathy in a beleif that the blessed pen would bring them higher marks. Such is the strong faith of the devotees visiting here. It is true that whoever comes here and blessed by the Goddess shine bright in their academics and other fine arts. On full moon nights, children are brought here and the word “Om” is written with a stick dipped in honey on their tongues.It is said that such children become fine orators, poets and good musicians. Temple Timings It is normally open from 7 am – 12:00pm and 4.30pm- 8:00pm. Where to Stay?There are no hotels here but, plenty of budget and semi deluxe hotels are in Kumbakonam and Mayavaram. Places nearby Sithalapathi Adi Ganapathi temple ( Ganesha with human face ) is nearby.